Book Launch “Happy Tropics” with Michael Schindhelm (author, culture adviser, theatre and film maker), Damian Christinger (curator, Zurich University of the Arts) and students of Zurich University of the Arts. This book is an attempt to translate new understandings of transcultural connections into a dialogue. Contributions and insights by important actors in the cultural field such as Eugene Tan, Rem Koolhaas, Benson Puah, June Yap, Gwee Li Sui, and Philip Ursprung, Michael Schindhelm and Damian Christinger frame research by students from the Zurich University of the Arts, and create a multi-voiced and multi-faceted approach to understanding the rapidly-changing cultural topographies of Singapore. Happy Tropics I consists of two parts that run (literally) parallel throughout the book. The first section, “Why Singapore,” focuses on insights from outside the city state, and consists of a conversation between Rem Koolhaas and Michael Schindhelm, an essay by Philip Ursprung, and an artistic contribution by the U5 art collective, among the contributions by the students of the Zurich University of the arts. The second section, “Learning from Singapore,” gives room to different voices from within, featuring interviews with Glen Goei, Beh Swan Gin, Benson Puah, Eugene Tan, and an essay by Gwee Li Sui. As Singapore becomes a global leader in both the financial and knowledge-production sectors, increasing emphasis is being put on both the production and dissemination of culture in the island-state. While it was still regarded as an “emerging country” two decades ago, it has become one of the leading nations regarding infrastructure, urbanisation, and service industries. The question as to whether arts and culture will follow suit is being closely followed by other nations worldwide who aspire to similar developmental goals. Singapore can be thought of as a kind of laboratory for the enabling, production, education, and consumption of arts and culture. Understanding culture as a mirror of society, instrument of national identification, and site for dialogue and exchange with other cultures allows us to view it as a litmus test for the resilience of an unprecedented societal concept. Within this framework, Happy Tropics I can be seen as a case study and a laboratory for different approaches to dealing with the challenges of globalization, as the cultural topographies of Singapore are not only changing, but also constituting themselves in our timeframe. Understanding the city as a responsive network that can be harnessed for research and education projects reflects this reality, and encouraged us to come with our students from the Zurich University of the Arts to Singapore, delving into its mesh and trying to learn that seeing eye to eye is so much more important then perceived hierarchies, a concept that is also reflected in the design and structure of this book. 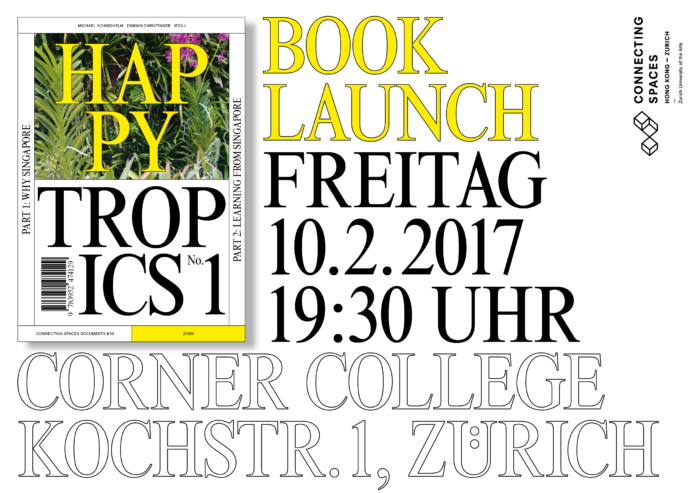 Happy Tropics I is a publication by Michael Schindhelm and Damian Christinger in collaboration with the Zurich University of the Arts, and is classified as the Connecting Spaces Document # 10.